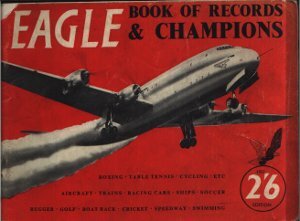 Eagle Books of Records and Champions doesn't actually have a cover that looks like this image. This image is taken from the inner front cover as the outer cover is just a plain red with an embossed title. This book pre-dates the Guiness Book of Records and offers a look at the most important records, with photographs of the record breakers. Dimensions : 22.5cm x 16.5cm with 96 pages.